Our Taipei Center was founded in October 2012 and started to provide Zen classes and trainings from January 1, 2013. Later in 2015, we established our San Jose Center in California, USA and 2017, Tainan Center, in Tainan City, Taiwan (check our History). All classes provided by our meditation centers are free of charge. It is because the financial support of our teachers, students, and friends that we can afford to pay the rent for these 3 meditation centers and keep the centers operating. We sincerely ask you consider providing a donation. Your gifts make it possible for us to keep the meditation centers operating and the Zen community growing. Your long term support will help to provide a place for people to learn and practice Zen meditation continuously. 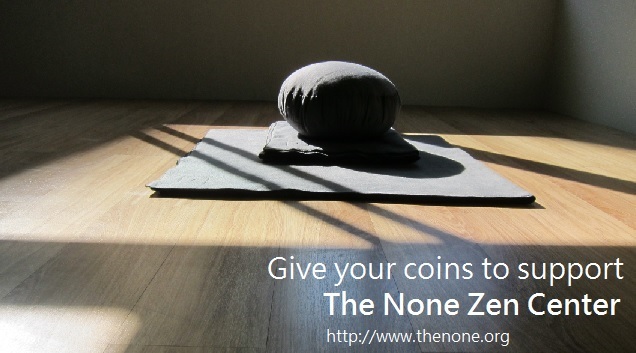 Above all, we sincerely invite you to start your Zen practice at The None Zen Center. Practicing Zen with us and getting to know yourself, you will understand why people need a place like this. The None Zen Center is Taiwan-based independent non-profit organization (ID No. 台內團字第1020345745號), not a subsidiary to any religious groups or any institutes. As required by Taiwan law, a non-profit organization accepts donation from its members only, unless for some specific charity campaigns. Therefore along with your first donation, you will be required to fill up a donation form with some of your personal information and automatically apply for the donor membership. A NT$100 of your first donation will be accepted as the donor membership fee.